Your favorite station now has your favorite fleet program. 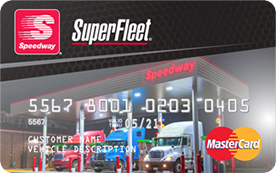 The Speedway SuperFleet MasterCard® gives your drivers fueling access at 2,700 Speedway locations in the US. with the added convenience of fueling at over 175,000 locations nationwide that accept MasterCard®. * A fleet favorite, Speedway locations across the east coast in the US can now be an integral part of how you manage your fleet effectively. Manage your account, add cards, turn off cards, and review invoices are a few of the ways our simple online access helps your monitor your fleet program. All of our security and fraud controls are at your fingertips from our online account management portal. Start saving money foryour fleet business today by choosing the right one. Fleet managers can saveanywhere from 10-15% when selecting a fuel management solution. Just answer afew questions about your fleet and one of our experts will recommend the rightfleet card program tailored to fit your business needs. † A Fleet Financials survey shows that, on average, fleets that change from no fuel management program to a managed fuel program realize savings of up to 15% on their overall fuel management costs. *Fees may apply. **Terms and conditions apply.